I've fished this place a few times now and I've had mixed results but I know for a fact there are some big fish in there. The Neponset Reservoir is the biggest body of water that I've fished and at first glance it seemed like an amazing find. There are sections of thick lilly pads, long grass, different points and coves, and a huge area that is all submerged tree stumps. The first time I went, it was late in the season and it was all choked up with weeds. It's difficult to know where the bass are holding when they could presumably be anywhere. That said, I fished a night tournament here in late May and we killed it on top water. With multiple 3#s on the MS Slammer and a 4-8 on the Whopper Plopper. only fished here once but it was the most disappointing day of fishing I have ever experienced. I've been back a few times since then, catching about 20 fish each day, the biggest going 3-9. You can find a public launch and some parking at the end of Kersey Road. Pretty much the entire shore of the reservoir is privately owned and as far as I can find there's really no shore access outside of the boat launch. The reservoir is divided into two halves, eastern and western halves. If you drop your boat in at Kersey, you will be in the southern end of the western half. The most success I had was in the coves just to the east of the launch and at the northern and eastern sides of Crescent Island. This will be one of my go to spots moving forward, especially early in the year before the weeds are too thick. Shore Fishing? Yes but very limited. If you get into the Lane Property from North street, you can walk in there and shore fish from wherever you want. I don't know if it's particularly fruitful, but there's definitely access. 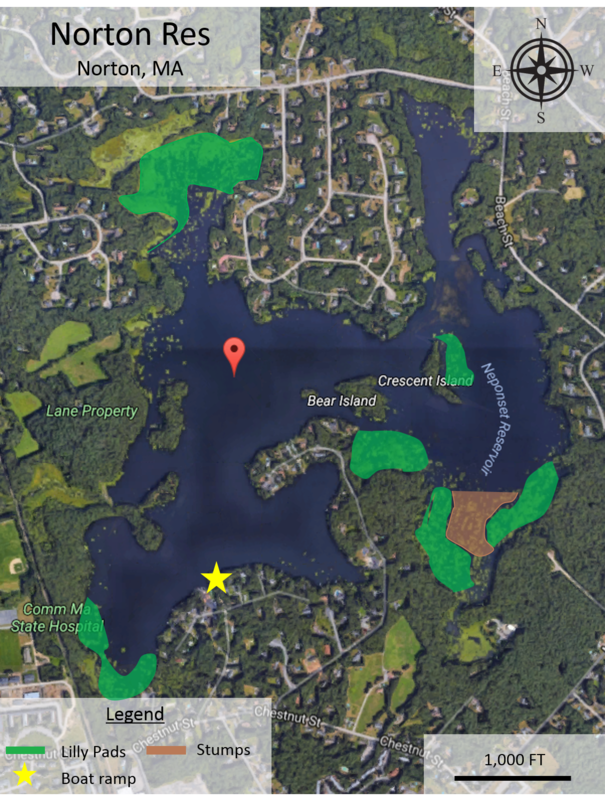 A fairly large area of the western shoreline has been designated as Conservation Land, co-managed by the town of Foxboro, and to a lesser extent, by the state of MA. This area CAN be hiked through (NO dirt bikes allowed, thank God), using part of the Warner Trail (many side paths lead down to the water); access & parking is at the RR tracks crossing on Chestnut St. - you can go all the way from that point, across the dam, through the Lane Property [part of the Conservation land] - and finally come out at the cul-de-sac on Monroe St. (the Warner Trail leaves the Reservoir area at that point. I was there YESTERDAY (07/23/2012) so I know that this is possible. Continued from above . . . I fished a bit as I hiked through the area (I keep a spinning rod and a mini, but well stocked tackle box in my car] . . . the results were far from spectacular, (I hooked three fish, but quickly lost each of them - I think that two of them were chain pickerel, & the other a small bass) but it convinced me that willing fish are certainly present. I have heard that this reservoir has LOTS of small bass, but 6 to 8 lb. bass are present and occasionally taken. I fished this lake on Easter this year, caught a total of 6 fish, 3 bass, two perch and a pickerel. It was windy, and the points adjacent to the coves seemed to produce the most strikes, although I did catch the biggest fish of the day 2.4lb. largemouth in very shallow water where all of the submerged stumps ( referring from above ) are. For gear, I have a small water tender boat with electric trolling motor ( my friend lives on the lake so that was my access point , a hummingbird fishfinder and for lures I was throwing everything at them. I caught 5 fish on a suspending jerk bait, and the biggest fish was caught throwing a green pumpkin shakey head, with a watermelon colored finesse worm. ** This body of water is only 8-10 feet deep AT ITS DEEPEST POINT ** this makes it difficult to find the fish, they can be almost anywhere. I am a catch and release guy, hope all of you are as well. Hope this helps, and I also hope to see you on the water. I fished out of one of Henry Heaton's boats back in the late 1940s into the 50s. Caught many bass in the 4 to 5 lbs. size and pickerel up to 6 lbs. many excellent white perch best bait was worms or live grayfish or F6 flat fish or a metal Gold Fish. Pickerel point out past the dam was always a great place for yellow perch. At that time if you fished the bottom you might hook into a huge snapper some as large as the bottom of a wash tub. The largest I recall was about 60 lbs. When ever you caught anything of size Vin Igo would put you and your catch in the Foxboro Reporter. At that time the Boggs as we called it was clean spring water the beach at Foxboro Fishing Club was a busy spot. Also the Dam and the Baby Hole near the dam was always busy. Blueberry Island had the biggest sweetest blueberries in town. I would ride my bike with the basket filled with quart jars several miles to a spot just past the baby hole and put my quart jars on a board and push them over to the island and fill them in short order return to my bike ride home and set up my stand to sell them at 50 cents per quart. When I first started to fish Mrs. Chase the game wardens mother loved to fish pickerel point and taught me how to tie on my hooks so I didn't have to cut the line each time to change hook size. My fishing buddy was Joe Brigham his dad had a row boat he would row and we would fish and yes we would catch enough to fill a bucket each time we went. But as years went by we all learned hook and release. I now live on S.Hutchinson Island Florida and still practice hook and release. Fishing will never be to me as wonderful as it was on the Boggs 70 plus years ago. I live on the "Boggs" today and loved hearing your childhood memory of the place. It's still quite beautiful today but no doubt it was more pristine in your past. Happy fishing and all the best. Cleaning a silk or designer tie can be tricky business. Here are a few tips to keeping your ties in the best shape possible. In the late 60's we would rent a boat from Ann's Boat Livery. Ann & Harry Ryan.What a fascinating old couple. They made the entire experience well worth the bass-less days. In those days we would clean up on panfish of all sorts and were encouraged to "fill the buckets', and fill them we did. The Ryans and their very interesting 'lodge are long gone. They were right next door to Heaton's. I returned there several years ago, over by the public works dept. I got a few small 'pond sized bass' but have never seen anything of good size there. At the Ryan's Lodge, where Ann would prepare a Chuck Wagon sandwich, served with a birch beer for you, were displayed hundreds of old black and white photos of heavily laddened stringers of bass.Along the walls of the livery hung dozens of massive snapping turtle shells, painted up , reminiscent of native American battle shields, matching the Native American motif decore of the entire area. Nope, never had much big fish success there, but, memories of Ann and Harry Ryan will live with me forever. p.s... I am strictly catch and release now,, including trout! What country are you in Muhammad ?